Searching for Bonobo in Congo » Who’s Illegal Load Busted Congo’s Bridge? « Update: Another Bridge Down on the Road through the Okapi Reserve. A bridge over the Epulu River crumpled earlier this week under the weight of a container truck of planks headed for Kenya that was about three times the permissible tonnage. The bridge over the Ituri River, along the same road, collapsed two years ago under similar conditions. Both overweight container trucks were filled with wood from the Ituri Forest. Was this wood legal? Wastefully rough cut with chain saws, stacked by the side of the road in the Ituri Forest, and waiting to be loaded and trucked east. I asked John Sidle. He is from the U.S. Forest Service, but working in Kinshasa for six months to help operationalize Congo’s Forest Code. “It is illegal, blatantly illegal”, he said. He sent the map and explanation below. But how can that be? These trucks have to go through two major cities with military and police outposts, as well as cross a well-patrolled border between two provinces, and finally cross the international border into Uganda. Certainly the politico-military administrations have plenty of opportunity to stop them. Unfortunately the explanation is simple. 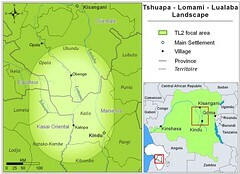 A local conservation NGO did a study of timber exploitation in this part of the Ituri Forest. The owners of the logging operations are all familiar names in the villages and towns: top political authorities of the District, top ranked military, the Police and the ANR (equivalent responsibilities to the FBI). The legal forestry concessions are in brown. In the east part of the country the only legal concession is number 28 or Enra based in BENI. No truck carrying wood east along the RN4 is carrying wood from a legal concession. This map also shows the Okapi Reserve (Réserve de Faune à Okapi) in the northeastern forest. Terese – The extraction of timber and the export of logs and wood products for commercial purposes are legal if the logs and timber products are coming from timber concessions and the 2002 Forest Code and promulgated regulations are being followed. An examination of a map of the logging concessions of DRC reveal that almost all concessions are in western DRC. So, logs and wood products are likely all exiting to the west down the Congo River. 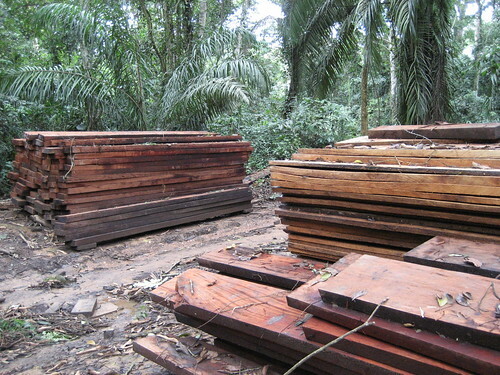 A small concession exists in eastern DRC and its wood likely exits legally to eastern Africa. The government sometimes issues permis-de-coup for small areas of forest (< 50 ha) but few are issued each year. Therefore, it seems likely that most all of the timber and wood products exiting DRC from its eastern boundary are illegal. Chocolate produced by a small maker (an artisan), usually from a unique blend of beans or a rare single type…. This entry was written by Terese Hart, posted on 2009-11-28 at 6:44 pm, filed under uncategorized. Bookmark the permalink. Follow any comments here with the RSS feed for this post. Post a comment or leave a trackback: Trackback URL. THis is not artisanal logging….this is the informal sector, and the operators are rapidly gaining capacity….One chain saw becomes two, even three…expect tractors, skidders and portable saw mills next…All likely to be in place without formal mapping and allocation of concessions….or transparent collection of taxes ….THe taxation process itself in this area is informal sector. I would like to ask your permission to use the image of the congo published on your homepage (http://www.bonoboincongo.com/2009/11/28/who%E2%80%99s-illegal-load-busted-congo%E2%80%99s-bridge/) for educational, non-profit purposes. The image would become part of an online learning platfrom for German students (available at http://www.glokalchange.de) about deforestation in the democratic republic of congo. The data source will be acknowledged of course. May I get the permission to publish the image? Moreover, it would be very helpful to have it in high resolution. Sure you can use the photo. The map can be gotten high resolution from WRI or probably OSFAC. The photo…hmmm, I will be able to go back into my photo files this weekend. Send another little reminder.